Russians out, Americans in, and Germans down. In December, Donald Trump announced his intention to withdraw all U.S. forces stationed in Syria in the space of only a few weeks. The move shouldn’t have come as a surprise. Trump railed against American involvement in the Syrian conflict on the campaign trail in 2016. He spent the first two years of his presidency seeking to avoid long-term strategic commitments in the area. Reports repeatedly indicated that the president was growing impatient with the American footprint on the ground in Syria, and he would soon withdraw those forces. And when he finally pulled the trigger, a universe of Republican opprobrium came down around his shoulders. Defense Secretary James Mattis resigned in protest. Director of National Intelligence Dan Coats would have followed him out the door but for the intervention of Vice President Mike Pence. Trump did his best to defend himself, insisting that America should avoid becoming the “policeman of the Middle East.” But, in the end, he could not withstand the pressure. The precipitous withdrawal of all the approximately 2,000 service personnel in Syria was soon abandoned in favor of leaving 200 advisors behind, then 400. At last count, at least 1,000 soldiers will stay behind, and that’s unlikely to be the final verdict. Donald Trump is the third consecutive president to win the White House on a platform that advocated a humbler foreign policy, and he’s the third consecutive president to fail in the effort to see that policy realized. There’s a lesson to be learned in this story, but it’s one that proponents of American withdrawal and retrenchment steadfastly refuse to internalize. They have instead adopted a conceit: Presidents who fail to divest America from its foreign commitments are led astray by blinkered or deceitful voices invested in America’s overextension. Proponents of retrenchment wallow in the misperception that the only obstacles to American withdrawal are ideational, not material, because hearts and minds are easier to change than grand strategy, alliance structures, the anarchic international environment, peer state competition, or the global threat matrix. That’s right. The Atlantic Alliance, the longest-lived multilateral military alliance in history, is about to implode amid fears that Germany, of all places, is insufficiently committed to rearmament. In justifying his fears about NATO’s long-term viability, Mead cites other genuinely concerning stresses on the alliance, including Italy’s efforts to cozy up to Chinese intelligence and the double game Turkey plays with the West’s adversaries. But his primary concern—the notion that the material threat posed by Russia is no longer perceived to be a grave threat to NATO’s largest member states—is uncompelling. 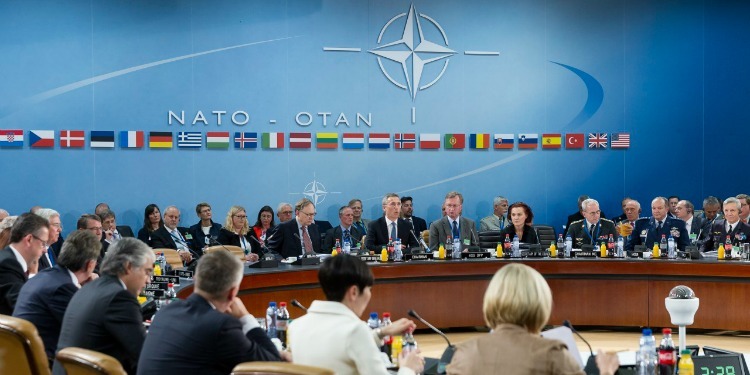 The fact is that 2018 was the fourth consecutive year that NATO members’ defense spending increased, with seven member states meeting the arbitrary defense-spending standard. The year 2019 notwithstanding, Germany, too, has committed to a series of defense-spending hikes. Overall, though, much of the alliance does not meet its self-set objectives in this realm. Mead is right that Trump is not to blame for NATO’s stresses, but nor is Trump responsible for increased defense commitments. The nations that commit to the 2 percent of GDP threshold are the most threatened: The United States and Britain, which bear a substantial burden for the preservation of the post-war political order; Greece, which borders hostile Turkey; and Estonia, Latvia, Lithuania, and Poland, all of which are staring down the hungry Russian bear. Nations that invest billions in defense do not do so at the behest of hectoring American presidents. They do so to preserve their vital interests. And NATO recognizes those vital interests are at risk. NATO is expanding its military presence in Europe, and not just on the periphery it shares with Russia. It is weighing new missile-defense deployments to counter Russia’s new strategic advantage, has deployed four new multinational battlegroups to Poland and the Baltic states, and is conducting joint preparedness exercises on a scale unseen since the dismantling of the Berlin Wall. All of this is a prudent response to Russian revanchism, which took on a newly urgent character in 2014 when Moscow became the first European power to invade and annex sovereign territory on the continent since 1945. Germany’s traditional ambivalence betrays the notion that Berlin is somehow uniquely hostile toward NATO’s efforts to contain Russian expansionism toward that project. German support for the Nord Stream II pipeline, a joint venture with Russia’s state-owned energy giant Gazprom, represents a strategic threat to Central and Eastern Europe because it would bypass them. But this kind of bet-hedging is not new. German political and commercial culture remains deeply conflicted about seeming too antagonistic toward Russia, and Germany tends to fancy itself a mediator between East and West. This is no departure from past practice. Whether its Pershing II missile deployments or the 2016 terrorist attack on a Berlin Christmas market, Germans have always been skeptical of over-reliance on their Western allies. Americans can be forgiven for feeling some resentment toward their aloof Teutonic allies, but that resentment cannot be allowed to manifest in retribution. Ensuring that a united Germany with tremendous influence in Europe remains committed to the status quo is by far the most important American objective, not forcing Berlin to commit the equivalent of another 0.75 percent of GDP to the Bundeswehr. As NATO’s first secretary general Hastings Ismay said, the purpose of the alliance is “to keep the Russians out, the Americans in, and the Germans down.” In that sense, NATO was and remains a spectacular success.